SUMMARY: In the summer of 1793, Philadelphia is a bustling city of 40,000 on the verge of a major yellow fever epidemic. At first, few people pay much attention; despite rumors of a serious plague, residents know that every summer brings fevers that are never really a huge deal. But as the disease spreads and kills hundreds, then thousands, panic sets in. Fourteen-year old Mattie Cook and her family soon realize that they tried to flee the city too late and are now in the midst of the deadly outbreak. 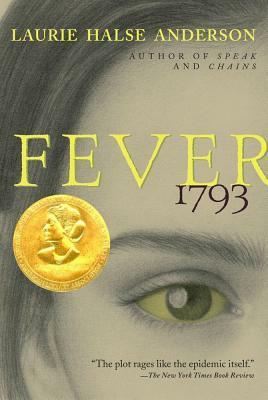 WHAT I LIKED: Fever 1793 is one of the many books I've planned to read for quite some time but never got around to doing it, so I was excited when it was selected for our YA book club. Although historical fiction is not my favorite genre, I really enjoyed this quick read. Before this, I knew relatively little of Yellow Fever, and I had no idea it had killed so many on our very own soil back in 1793. Anderson really did her research, and I enjoyed learning about this disease and life at that time. Protagonist Mattie is a strong-willed young lady who must cope with this nightmare almost totally on her own. Yes, she has her mother and grandfather, but there are plenty of times they cannot help her. She is resourceful and strong and never hesitates to help others around her, even knowing that she could catch the disease just as easily as anyone else. There is light romance, but it's not the main story and doesn't even become anything much until near the end. I liked Nathaniel quite well; though he doesn't appear often, I still felt like I knew his character well. I also liked how the African-American characters were portrayed as heroes in the story, even though many people at the time disagreed with that. I loved the historical notes at the end and how almost all the book's characters were real people. The notes reminded me of those "after" notes at the end of movies, where they tell what happened to the characters after the story. WHAT I DIDN'T LIKE: There are those books that I read and love and gush over when I talk about them with students or librarians, but Fever 1793 isn't one of them. Sure, I enjoyed it, but I don't know how well I will remember it in a few months. It is good, and I will recommend it to students, but I won't be gushing or telling people they "just have to" read this one. THE BOTTOM LINE: With strong characters and a fast-paced plot, Fever 1793 portrays an interesting part of US history through a cast of strong, likeable characters. Recommended for anyone, particularly those who love historical fiction. STATUS IN MY LIBRARY: We have it, but it doesn't get much checkout (historical fiction is not that popular in my library). Maybe now that I have read it and plan to recommend it, checkout for this title will improve. Great review - I have been wanting to read this one, too! If you want a good nonfiction option, An American Plague by Jim Murphy is about the yellow fever outbreak as well. You can read my review of his book at childrenslitreviews.wordpress.com. Thanks!